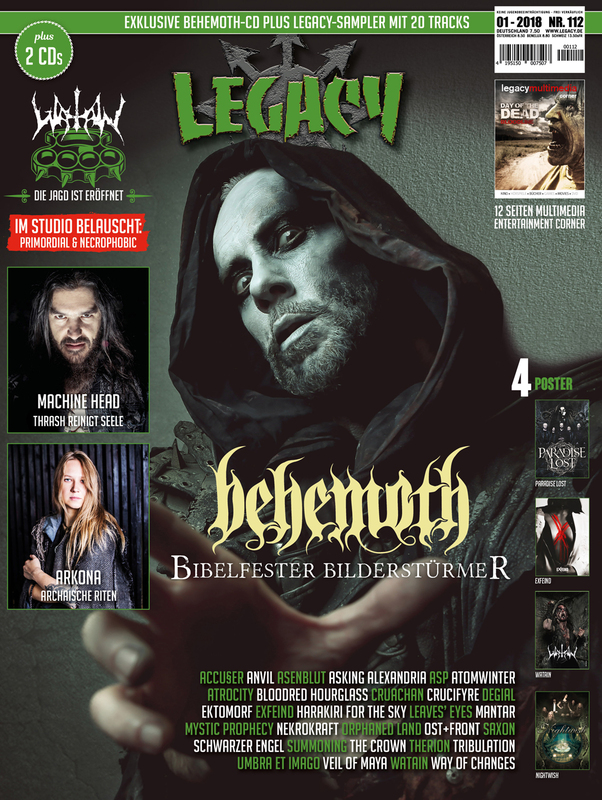 Nach dem großen Afrika-Metal-Special der letzten Ausgabe haben wir nun wieder ein klassisches Band-Feature mitsamt Begleit-MCD als Kernthema: Bei Behemoth bilden Musik, Texte und Optik seit 25 Jahren eine feste Einheit, was sich in faszinierenden Konzerten niederschlägt. Insofern ist die „Messe Noir“-DVD ein willkommener Anlass, Nergal in der Titelstory auf den Zahn zu fühlen Zudem stellen wir den kompletten Backkatalog vor. Co-Titelhelden sind zum einen die Moskauer Pagan/Folk Metal-Institution Arkona, zum anderen die Bay-Area-Legende Machine Head. Following the huge African Metal special in our previous issue we’re focusing on a traditional band feature with an additional MCD this time: Music, lyrics and the visual context built up a strong unity within the Behemoth universe since 25 years – a foundation for fascinating concerts. So the “Messe Noir” DVD is a damn good reason to get updated by Nergal in form of a title story. Additionally we present reviews for the whole massive back catalogue of the band. Co-title heroes are Arkona, the Pagan/Folk Metal institution from Moscow, and the Bay Arae legends Machine Head.